If you are heading to the beach this summer, you need to schedule a session for your beach portraits in Perdido Key. Professional portraits are a fun way to spend a little time on the beach with the family and take home some awesome memories. In today's cell phone world of Pokemon Go, family time is a necessity that many seem to overlook. I find it humorous that while taking a stroll on the beach almost every person you pass has their nose in a smartphone. This is great for families that don't do the smartphone thing because there is now an abundance of awesome seashells because they haven't made an app to find shells yet. Thus they are everywhere. Our little princess from last night's sunset session took full advantage. 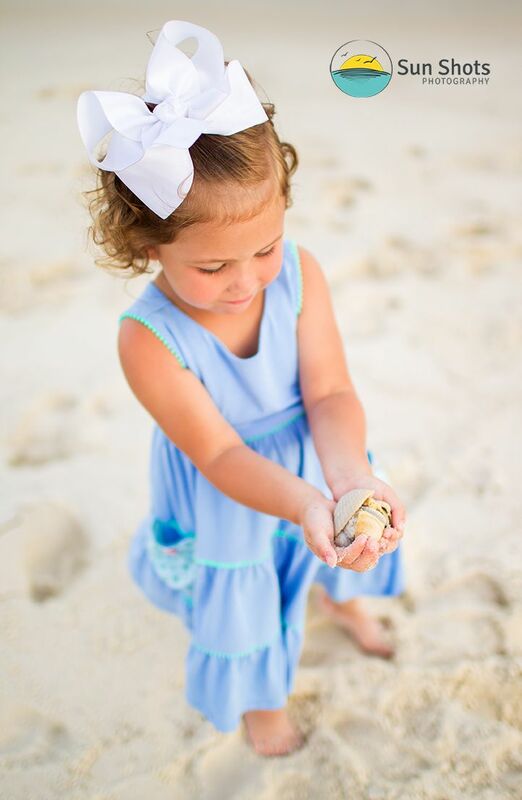 She found so many that dad's pockets were literally overflowing with shells. If your family is a smartphone family, don't worry we don't allow phones at our sessions which will only mean one thing, you get to actually have a little-uninterrupted family time. Something that is much needed in this modern world, where kids grow up behind a screen. We are here to not only make perfect family portraits but to help you cherish every single second we spend together on the beach. We promise the session with be fun and full of good ole family time. We promise the memories we make will last forever, and that you will cherish them like none other. We are a husband and wife team, and we understand what you want. With over twenty-five years of combined experience, we will cater the session to your family. So pick up that phone and call us today. Slots are limited so don't pokey mom, call us now!! !